The president visited the site, where 40 passengers and crew members aboard United Airlines Flight 93 died after terrorists hijacked the plane Sept. 11, 2001, this month. 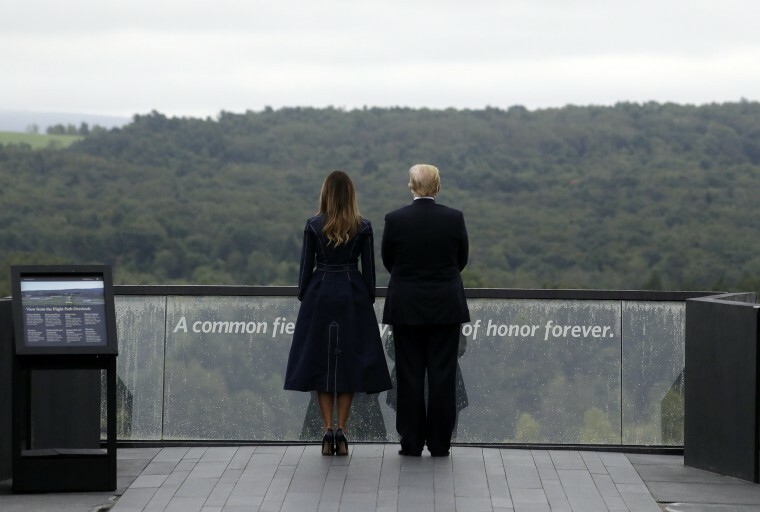 WASHINGTON — President Donald Trump said he found inspiration for the U.S.-Mexico border wall after visiting the Flight 93 National Memorial this month for a ceremony commemorating the 17th anniversary of the 9/11 attacks. The memorial marks the site where United Airlines Flight 93 crashed in an open field after 40 passengers and crew members tried to overtake terrorists who had hijacked the plane. Trump also continued to rise expectations for the Republican Party's electoral prospects in November, pointing to the economy as reason for confidence. “I think we’re going to do much better than anyone thinks because the economy is so good, and people do like the job I’m doing,” he said. Trump’s comments on Tuesday came as Republicans fretted that his public confidence in the party's midterm chances may be leading his supporters to believe the party is in little jeopardy of losing control of the House, leading to complacency that could depress GOP turnout on Election Day.